Esfahan or Isfahan is a city in Iran, which is included in the list of World Heritage Sites by UNESCO for the precious architectural sites of the Islamic culture, most of which were erected between 11 and 19 century. This village, where history and modern life go hand in hand is located in the foothills of the Zagros mountain range, in the fertile valley of the river Zayandeh Rudd. Isfahan is a major center of the Iranian province and the third largest city in the country. Its strategic location is such that it is in the absolute geographic center of the country amidst the Iranian plateau. Isfahan is the intersection of major roads that pass from north to south and from east to west. Isfahan is truly an amazing city, reminiscent of a European capital. In external appearance this Asian city is indistinguishable from the modern world centers, here you find the hectic pace of life, mobile communications, countless neon signs are not absent even a step away from the modern part of town. 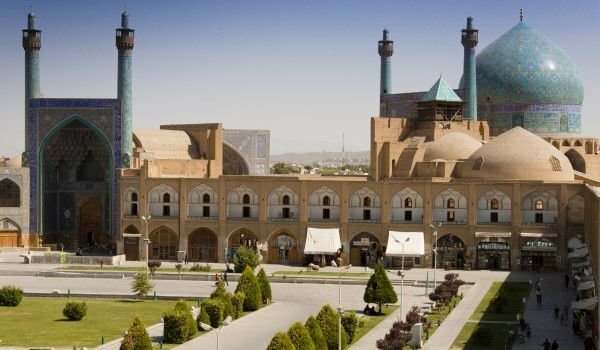 A walk in Isfahan must start from square "Emam" which is huge and long, as its shape resembles a rectangle. Its length reaches 512 m and the width is 159 m. Around it are concentrated most of the significant historic buildings. In the middle there are beautiful green meadows, ponds and fountains. At one end lies one of the most beautiful mosques in the world - Imam mosque. The view of it is amazing and filled with incredible architecture, mosaics and frescoes. The colored bricks are typical of the Arabic masterpieces of Chahar-Ivan and the Sheikh Lotf Allah mosque. The domes of all buildings in Isfahan are really impressive, but many of them are built in local style called “Safavid”. At the western end of the square in Isfahan is the gate and the palace of Shah Ali Capua. On the roof there is a special terrace from which the family of the Shah once watched the Iranian version of polo game. From the palace itself is a splendid view over the square.